slogan: Motorcycle Art. Since 1945. MV Agusta, originally Meccanica Verghera Agusta, is a motorcycle manufacturer founded on 12 February 1945 near Milan in Cascina Costa, Italy. The abbreviation MV stands for Meccanica (mechanics) Verghera, the hamlet where the first MVs were made. The company manufactured small-displacement, café racer-style motorcycles (mostly 125 to 150 cc) through the 1950s and 1960s. 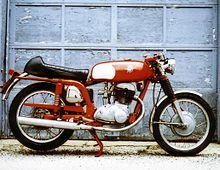 In the 1960s, small motorcycle sales declined, and MV started producing larger displacement cycles in more limited quantities. A 250 cc, and later a 350 cc twin were produced, and a 600 cc four-cylinder evolved into a 750 cc. The MV Agusta company was notable for its successful motorcycle racing department and multiple Grand Prix motorcycle racing world championships. The MV Agusta company began as an offshoot of the Agusta aviation company formed by Count Giovanni Agusta in 1923. The Count died in 1927, leaving the company in the hands of his wife and sons, Domenico, Vincenzo, Mario and Corrado. Count Vincenzo Agusta together with his brother Domenico formed MV Agusta at the end of the Second World War as a means of saving the jobs of employees of the Agusta firm and also to fill the post-war need for cheap, efficient transportation. The brothers had a passion for mechanical workings and for motorcycle racing. Much like Enzo Ferrari, they produced and sold motorcycles almost exclusively to fund their racing efforts. They were determined to have the best Grand Prix motorcycle racing team in the world and spared no expense on their passion. MV Agusta produced their first prototype, called "Vespa 98", in 1945. After learning that the name had already been registered by Piaggio for its Vespa motorscooter, it was referred to simply by the number “98”. In 1948, the company built a 125 cc two-stroke single and entered Franco Bertoni in the Italian Grand Prix. Bertoni won the event held in Monza and instantly put the new motorcycle manufacturer on the map. Cagiva purchased the MV Agusta name trademarks in 1991. In 1997 it introduced the first new MV Agusta motorcycle. The new bikes were four-cylinder 750 cc sports machines, the F4 range, which included a series of limited production run models, such as the all black paint work SPR model (Special Production Racing) which was featured in the movie I, Robot. In 2004 they introduced their first 1,000 cc bike. 2004 marked the end of production for the 750 Sport machines, with limited production of 300 SR (Special Racing) models in the traditional red and silver livery. Towards the end of March 2016, media reports started to appear which indicated that MV was again experiencing serious financial problems (including a debt of €40 million) and that it had obtained a concordato in continuità aziendale order which would, in the short-term at least, protect it against creditor claims whilst it attempted to find new sources of capital. This was followed in early April by reports that MV was negotiating the repurchase of AMG's 25% stake in the company and looking for a new major investor, whilst retaining the majority shareholding of the Castiglioni family. Even of greater concern, were reports that MV were not delivering any spare parts and that the factory might have ceased production. A refinance was announced in October 2016, with funds from Black Ocean Group. In March 2018, the CEO of MV Agusta, Giovanni Castiglioni, announced that the company was working on three new motorcycles based on a new 1,000 cc engine. The bikes would consist of a naked roadster, a café style roadster, and a replacement of the F4 superbike that will cease production in December 2018. The F4 replacement could be electric/gas hybrid, reportedly making more than 300 horsepower, and potentially would not be ready for production until 2021. In 2018 it was announced that MV Agusta would return to grand prix racing as well with Forward Racing. The new bike will begin testing in July for a return to racing in the 2019 season. It will be the first time since 1976 that MV Agusta will have an entry on the grand prix entry list when it dropped out due to financial difficulties. ^ "Harley-Davidson Acquires Both MV Agusta & Cagiva!". SuperbikePlanet.com. Archived from the original on 2008-07-14. Retrieved 2008-07-11. ^ "Harley-Davidson to acquire Mv Agusta Group expanding presence in Europe". Harley-Davidson.com. Archived from the original on 2008-07-15. Retrieved 2008-07-11. ^ Michele Coppola (2010-03-26). "MV Agusta: Sales Increased by 50%! | Motorcycle News". Ultimatemotorcycling.com. Retrieved 2010-06-26. ^ "Mercedes Amg compra il 25% di MV Agusta". ilsole24ore.com. ^ "No, MV Agusta Hasn't Declared Chapter 11 Bankruptcy". asphaltandrubber.com. 28 March 2016. ^ Giorno, Il (27 April 2016). "MV Agusta divorzia da Mercedes: "Stiamo cercando nuovi investitori" - Il Giorno". ilgiorno.it. ^ "MV Agusta : Varese ne répond plus… J'ai des doutes …". www.motoservices.com. ^ "MV Agusta Working on Three New 1,000 cc Motorcycles - NDTV CarAndBike". CarAndBike. Retrieved 2018-06-15. ^ "Fogarty team confirms 2008 return". BBC SPORT. May 2, 2007. Retrieved May 19, 2010. ^ "MV Agusta Name Returning to Grand Prix Motorcycle Racing". RideApart. Retrieved 2018-06-15. Wikimedia Commons has media related to MV Agusta motorcycles. This page was last edited on 21 April 2019, at 21:25 (UTC).